To ask other readers questions about Anatomy of an Illness, please sign up. I was undergoing treatment for a life-threatening condition. One of the medical techs at the hospital loaned this book to me. I found the author's observations to be spot-on and had been espousing many of the same thoughts from my own experience. This is a short read and one that puts the patient's role in his or her own healing in perspective. My doctors didn't let me take a passive role in my treatment and I'm so glad they didn't. Anatomy of an Illness was ahead of its time in that respect, but I was undergoing treatment for a life-threatening condition. One of the medical techs at the hospital loaned this book to me. I found the author's observations to be spot-on and had been espousing many of the same thoughts from my own experience. This is a short read and one that puts the patient's role in his or her own healing in perspective. My doctors didn't let me take a passive role in my treatment and I'm so glad they didn't. Anatomy of an Illness was ahead of its time in that respect, but today, there's no excuse for someone to glibly hand their health over to anyone. Moreover, the role of attitude, pain, and outlook are so important. A mind over matter account of illness. Great one to be reading at this time of year when everyone around me is dropping like flies, slayed by this or that lurghy. With the vitamin C and positive thinking endorsed by Cousins, I feel like I have the best defence. Both fascinating and empowering, this book is one I would really recommend. Cousins highlights the medicinal power of psychological cheer, noting the physiological and chemical effects that laughing and contentment can have. HIs reasoning A mind over matter account of illness. Great one to be reading at this time of year when everyone around me is dropping like flies, slayed by this or that lurghy. With the vitamin C and positive thinking endorsed by Cousins, I feel like I have the best defence. Norman Cousins, a journalist and professor, believed in taking massive doses of Vitamin C and laughing to cure illness. Perhaps more important than either one of those specific treatments, he believed in the power of placebo and each person’s ability to heal their own illnesses. 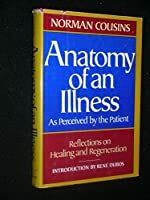 Cousins’ Anatomy of an Illness as Perceived by the Patient: Reflections on Healing and Regeneration was originally published in 1979 and is now considered an important classic of patient involvement in medical care. Cousins documents his own path to healing from his diagnosis of a serious form of arthritis called ankylosing spondylitis (doctors give him a chance of recovery of 1 in 500): he stops taking his prescribed medications, and he leaves the hospital, which he views as not conducive to his healing. He checks into a hotel, and watches funny movies, laughing bunches. After he laughs, he sleeps. He gets an IV of Vitamin C, a slow drip so his body can absorb the Vitamin C better than if he consumed it all at once. And then he gets better. Obviously, there is much debate about Cousins healing himself this way. Many doctors speculate that he has experienced a placebo effect, or a perhaps (it is now speculated) a misdiagnosis. Rather than protest the placebo idea, Cousins embraced it. “Many medical scholars believed that the history of medicine is actually the history of the placebo effect,” he said. The history of medicine is full of toxic remedies, and we survived these things and even felt better once we took them as cures, perhaps because of placebo. “The placebo is the doctor who resides within,” Cousins said, claiming placebo as an amazing part of our own capacity to heal. While some of the book is outdated, some of it comes across as an almost prescient warning of what will be lacking in medical care in the future. I have been reading Ben Goldacre‘s Bad Pharma as well. If Cousins’ book, written 30 years ago, was a warning shot fired into the air that something was wrong with the way we demand and receive medical care, then Goldacre’s book is the summation of that dysfunctional medical train rolling forwards at full speed. In the chapter called “Pain Is Not the Ultimate Enemy,” Cousins speaks to one of the main themes of his book, the overprescription of unneeded drugs. We are overeducated on pills we can take, while being undereducated on usual causes of pain (like stress) and how to solve those problems ourselves. He says, “We know very little about pain and what we don’t know makes it hurt all the more. Indeed, no form of illiteracy in the United States is so widespread or costly as ignorance about pain–what it is, what causes it, how to deal with it without panic. Almost everyone can rattle off the names of at least a dozen drugs that can deaden pain from every conceivable cause–all the way from headaches to hemorrhoids.” Cousins suggests we could combat this lack of knowledge with education about pain in schools, and “If our broadcasting stations cannot provide equal time for responses to the pain-killing advertisements, they might at least set aside a few minutes each day for common sense remarks on the subject of pain.” I do wonder how Cousins would react if he saw the advertisements on television now, not only for over-the-counter pain medication but for prescription drugs tailored towards every ailment you can imagine, side effects crammed into a voice-over while people dance through a field on screen for the last ten seconds of the commercial, like some bizarre bad joke. In the last chapter, “Three Thousand Doctors,” Cousins talks of the importance of touch in the doctor/patient relationship. I have talked about this with so many people, how doctors seem to just read charts and then prescribe medicines without doing much of a physical exam anymore, and how odd that is. A pain doctor recommended facet injections for lower back pain without feeling the area of my lower back that was in pain. Did the doctor know what he was doing? Probably. Am I confident in my doctor, knowing he will shoot a needle in my spine without taking the time to feel what is going on in my lower back? Certainly not. In this chapter Cousins also brings up what seems like a quaint idea to me, that in order to have trust with your physician, they need to be the one to meet you at the Emergency Room during a heart attack. Who has that sort of relationship with a doctor now? "What was significant about the laughter, I said, was not just the fact that it provides internal exercise for a person flat on his or her back — a form of jogging for the innards–but that it creates a mood in which the other positive emotions can be put to work, too. In short, it helps make it possible for good things to happen. Carole wanted to know how she could find things worth laughing about. I said she would have to work at it, just as she would have to work at anything else worthwhile." Anatomy of an Illness as Percieved by the Patient is a great book by Norman Cousins that I frequently suggest to patients and families of patients who have significant illnesses and have lost hope. I volunteer visit assisted living facilities with one purpose in mind. Laughter!!! Cousins’ book suggests vitamin C and various methods to distract the infirm individual from dwindling away. Laughter can make tons of difference. I have a 3 star rating system of 1= smile, 2=chuckle, and 3=robust laughing Anatomy of an Illness as Percieved by the Patient is a great book by Norman Cousins that I frequently suggest to patients and families of patients who have significant illnesses and have lost hope. Laughter can make tons of difference. I have a 3 star rating system of 1= smile, 2=chuckle, and 3=robust laughing. My goal is many 3s as possible. This works even during childbirth to reduce discomfort and supplement faster births. Cousins suggests patients watch funny TV, even cartoons that generate laughter. Robust laughing releases endorphins which have restorative and regeneration powers as well as reducing pain, and vulnerability as well as improving outlook no matter how old you are. I recommend this book often. Anatomy of an Illness gives you a patient in the 1960s who was diagnosed with a life threatening illness. He didn't just accept the doctor's news, he decided he would try different concepts in helping to heal himself. He was a big believer in Vitamin C which made a difference in his illness. Fortunately, his doctor went along in trying some of the various ways he was tested. Laughter was found to be a large part of helping pain level. They would test before and after watching a funny show and ho Anatomy of an Illness gives you a patient in the 1960s who was diagnosed with a life threatening illness. He didn't just accept the doctor's news, he decided he would try different concepts in helping to heal himself. He was a big believer in Vitamin C which made a difference in his illness. Fortunately, his doctor went along in trying some of the various ways he was tested. Laughter was found to be a large part of helping pain level. They would test before and after watching a funny show and how it allowed him to get a pain free rest. As anyone who has spent time a hospital knows, sleep is hard to get when the nurses are waking you for vitals throughout the night. This was an interesting book and definitely worth reading to see if laughter is the best medicine for you! Anatomía de una enfermedad es un libro alucinante. No solo habla acerca de la enfermedad en si, sino que también de la risa, el humor, la vida y hasta la capacidad mental y corporal de la persona para buscar componerse de un mal. Su protagonista y autor, Norman Cousins, fue, a los cincuenta años de edad, diagnosticado con espondolitis anquilosante. Una enfermedad sumamente dolorosa que lo aisló completamente hasta entrar en una depresión. A medida que la enfermedad lo consumía, los médicos no log Anatomía de una enfermedad es un libro alucinante. No solo habla acerca de la enfermedad en si, sino que también de la risa, el humor, la vida y hasta la capacidad mental y corporal de la persona para buscar componerse de un mal. Su protagonista y autor, Norman Cousins, fue, a los cincuenta años de edad, diagnosticado con espondolitis anquilosante. Una enfermedad sumamente dolorosa que lo aisló completamente hasta entrar en una depresión. A medida que la enfermedad lo consumía, los médicos no lograban detectar como curar esa enfermedad, por lo que, como recurso para mantenerlo alerta, el médico de cabecera le recetó ver películas cómicas. Celebrating the truth that laughter is the best medicine. This is a book that when I originally read (when it came out) I thought was wonderful. When I became ill, I still thought it wonderful. Now that I am somewhat more in a stable health state, which a chronic illness, I still say laughter heals. Laugh often and laugh freely, alone or with loved ones. It makes life sweeter. In this book Norman Cousins makes some interesting observations about dealing with illness and the often difficult relationships between medical practice and the individuals that it purports to help. However, overall it is a self-help book which rallies the patient to take responsibility for their part in their healing. Whilst not for one moment suggesting that this is not a good idea, I got the sense that it was getting very close to the tyranny of positive thinking. Whilst positive thinking ca In this book Norman Cousins makes some interesting observations about dealing with illness and the often difficult relationships between medical practice and the individuals that it purports to help. However, overall it is a self-help book which rallies the patient to take responsibility for their part in their healing. Whilst not for one moment suggesting that this is not a good idea, I got the sense that it was getting very close to the tyranny of positive thinking. Whilst positive thinking can help some individuals to play the hand that life has dealt them (John Milton famously said that the mind is its own place, and in itself can make a heaven of a hell, and a hell of a heaven), I don't believe that positive thinking can cure a terminal illness. There just is not enough evidence for either positive thinking or vitamin C. It is more like faith. As for watching funny films instead of taking pain relief - well, if it works for you - great! Dealing with illness is a huge challenge and Cousins articulates a number of these challenges but his proposed solutions which all hinge on the power of the mind over the body are to me much like praying to a god of some kind. No doubt, this works for some but unfortunately I fear that many positive thinkers have been floored by illness as much as the non-positive thinkers. My Mother gave me this book early this past year. I had forgotten about it and saw it on my bookshelf. I would have given this book 5 stars but Chapter 5 bothered me a great deal. I couldn't disagree with the author more on his comments regarding doctors and holistic medicine. Perhaps his experience has been a positive one but my personal experience and that of my family's, doctors were outright hostile about even discussing holistic medicine. Regardless of how much holistic medicine has helped My Mother gave me this book early this past year. I had forgotten about it and saw it on my bookshelf. I would have given this book 5 stars but Chapter 5 bothered me a great deal. I couldn't disagree with the author more on his comments regarding doctors and holistic medicine. Perhaps his experience has been a positive one but my personal experience and that of my family's, doctors were outright hostile about even discussing holistic medicine. Regardless of how much holistic medicine has helped certain individuals, many doctors scream quakery. Doctors that I have met dismiss nutrition. This sort of attitude came from a team of doctors at 1 of the top hospitals in Boston. So perhaps the author was fortunate enough to encounter good doctors, who do in fact care about their patients, this however was not our experience. On May 1, 2015, I will have prevented mania or depression from sending me to hospital for 14 years. Even though I only finished reading this book today, many of its ideas and principles have been key to me staying well. Patients need to participate with their physicians in their treatment. Brilliant work! Only 1 chapter was on his illness; the rest was about the system in general. Wanted more personal stories! At first I didn't realize this book was published in the 70s. I hadn't before read anything about Cousins's experience, but his name was familiar. Our minds are powerful. What we think about matters and definitely has an effect on our bodies. I believe in the placebo effect. It was interesting reading about it in this book. I like what he says about pain. I do take pain relief too quickly without getting rid of the stress and other sources first. It's too easy to run to a doctor than to let our At first I didn't realize this book was published in the 70s. I hadn't before read anything about Cousins's experience, but his name was familiar. Our minds are powerful. What we think about matters and definitely has an effect on our bodies. I believe in the placebo effect. It was interesting reading about it in this book. I like what he says about pain. I do take pain relief too quickly without getting rid of the stress and other sources first. It's too easy to run to a doctor than to let our bodies have time to heal. Sometimes strange things happen that quickly come and go on their own. The older and more experienced I get the less worried I am about physical ailments. I pay attention to trends and ask myself, "Is it getting better? Or worse?" If it's not healing on its own it makes sense to seek medical treatment and help. Hopefully I'll recognize if something needs immediate help. Regardless of whether or not it's actually curative, I feel better when I think more positively and when I'm surrounded by laughter. After reading this book, I want to take better ownership of my health. I want to laugh more. Vitamin C supplements aside, this book just makes sense to me. Pretty interesting read, especially given that it was written in the 70s. In some ways we've come a long way since then. In others, we have a long way to go. This book examines the patient experience as the author found it in the 1960s and into the 1970s. Cousins emphasizes the importance of the patient taking responsibility for his own recovery, especially in the sense that the patient must have the will to live. Cousins uses his own experience with a collagen deficiency that the doctors told him was incurable to illustrate how the human body has a stronger capacity to heal itself than perhaps the medical community recognizes. He discusses the need This book examines the patient experience as the author found it in the 1960s and into the 1970s. Cousins emphasizes the importance of the patient taking responsibility for his own recovery, especially in the sense that the patient must have the will to live. Cousins uses his own experience with a collagen deficiency that the doctors told him was incurable to illustrate how the human body has a stronger capacity to heal itself than perhaps the medical community recognizes. He discusses the need for the body to return to homeostasis, which he achieved by going off most of his medication. He promotes laughter as a treatment because positive emotions lead to favorable effects on other bodily processes, just as stress can wreak havoc on the body. Cousins also advocates proper nutrition as a means to achieve homeostasis. He comes out generally in favor of the holistic approach to health care. He believes in the power of the placebo because he thinks, with research to back his point, that the mind has some control over bodily function. He points out that there are cases where serious medical intervention is necessary, but he wishes that more doctors would be open to new ideas in nutritional and homeostatic approaches as well. Because of my most recent surgeries and radiation, I very much related to this book. I have been on so much medication in addition to the actual addition that at times I felt as though I was being poisoned. It got to the point where I preferred the pain to the drugs because there were so many side effects. Cousins thinks we have become too afraid of pain and that we miss cues from our bodies by shutting off pain signals. This lack of attention can prolong our problems because we never fix the root cause. I found this circumstance to be true. I had every kind of pain killer, muscle relaxant, Botox injections, but it was not until they found that I had inflammation from radiation that they were able to actually help me relieve my pain. This book was the first place I found support for not wanting to take more pills. I imagine my body as craving this homeostasis, the ability to function on its own. Unlike many of the patients in Cousins’ examples, I had no difficulty in talking with my doctors about different options, and they never dismissed my opinions, but it still took months to find a solution. Cousins points out that his homeostatic approach does not work well in hospitals. It made me think how antithetical to healing and comfort the hospital really is. It becomes a question of treating the disease or treating the patient. For example, does every patient need to be woken up to have their temperature taken when they can only get a few hours of sleep? Of course, some do need to be monitored that closely, but not all. I have often heard that patients recover much faster when they can return home, and that has been true in my situation. Cousins theories of being able to sleep and eat well at home more than in the hospital make a lot of sense. But I believe it is a failing of our system that we have not addressed some of these issues in the hospital setting. I found one passage from the book that described the experience of chronic illness very well. It might be helpful in trying to explain the patient experience to others. There was a subconscious fear of never being able to function normally again—and it produced a wall of separation between us and the world of open movement, open sounds, open expectations. There was a reluctance to be thought a complainer. There was a desire not to add to the already great burden of apprehension felt by one’s family; this added to the isolation. There was the conflict between the terror of loneliness and the desire to be left alone. I didn't know what to expect with this book, but was astonishingly surprised to find a jewel. What does healthy aging look like? What does recovery from disease and illness look like? Norman Cousins was diagnosed with a life threatening illness. He was blessed with a cooperative physician who was also a personal friend, and he rejected the traditional diagnosis and treatment for his illness. He instead replaced the hospital with a stay in a hotel where he had massive IV doses of Vitamin C and wa I didn't know what to expect with this book, but was astonishingly surprised to find a jewel. What does healthy aging look like? What does recovery from disease and illness look like? Norman Cousins was diagnosed with a life threatening illness. He was blessed with a cooperative physician who was also a personal friend, and he rejected the traditional diagnosis and treatment for his illness. He instead replaced the hospital with a stay in a hotel where he had massive IV doses of Vitamin C and watched comedy after comedy to allow "laughter" to be the best medicine. Cousins thus began a book where he examines illness, disease, aging, and death..... all from the perspective of the patient. I found out about this book when I was reading "The Grace In Dying", and it referenced a powerful description of how medical technology and medical help appears to someone who is ill, old, or in need of a healing human touch. The two sections that were most amazing to me involved the author's visit with Pablo Casals when he was in his 90's, and also Albert Schweitzer, also in his 90's. Cousins witnessed Casals being led into the room by his wife, bent over and shuffling from arthritis and age. When he sat at the piano and began to play his daily dose of Bach, his hands unstiffened, his back straightened, and his hands became supple and active. As the author says, "Creativity for Pablo Casals was the source of his own cortisone." Creativity heals! Schweitzer also believed firmly in the healing power of music and also of the role of humor in healing. He made a special effort each day to bring laughter into the routine of the patients, nurses and doctors at the hospital. pg 96 "At any rate, long before my own serious illness, I became convinced that creativity, the will to live, hope, faith, and love have biochemical significance and contribute strongly to healing and to well being. The positive emotions are life-giving experiences." This is an excellent read for people of all backgrounds. It never delves too deeply into the science, but it has just enough to satisfy individuals with basic background in healthcare. As someone who is pursuing a career in healthcare and educated heavily in the basic sciences, I must admit that I came into this with a rather closed mind; I only picked up the book because another writer and physician who I highly admire and respect wrote of Norman Cousins in a very positive manner. I was pleasan This is an excellent read for people of all backgrounds. It never delves too deeply into the science, but it has just enough to satisfy individuals with basic background in healthcare. 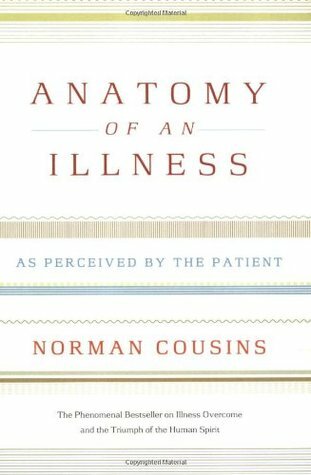 As someone who is pursuing a career in healthcare and educated heavily in the basic sciences, I must admit that I came into this with a rather closed mind; I only picked up the book because another writer and physician who I highly admire and respect wrote of Norman Cousins in a very positive manner. I was pleasantly surprised at how easy of a read this was, and how skillfully Norman Cousins leads me to an understanding of what he was trying to accomplish in writing this book. He never makes any grandiose claims, always erring on the side of caution, and yet provides all with hope through his own experience. I have highlighted specific sections that I will re-read at a later date. I feel that these will be one of those books that I will carry with me for a long time to come, so as to remember the important lessons within it as I practice in case I lose them over the years. I read Cousins' first edition of Anatomy of an Illness way back when...it was terrific then, and hasn't lost any of its relevance today. It essentially energized an entire movement around mind/body health, and cracked open the possibility in many previously closed minds that there might be more important inputs into human health than drugs and surgery. Indeed, as I recall, Cousins became the first non-MD member of the faculty at a prominent medical school, based on his experiences and writing. T I read Cousins' first edition of Anatomy of an Illness way back when...it was terrific then, and hasn't lost any of its relevance today. It essentially energized an entire movement around mind/body health, and cracked open the possibility in many previously closed minds that there might be more important inputs into human health than drugs and surgery. Indeed, as I recall, Cousins became the first non-MD member of the faculty at a prominent medical school, based on his experiences and writing. The hope he gave (and that his books continue to give) to many who are facing serious illness and diminishment of quality of life is extraordinary. Attention to nutrition, spiritual and emotional health, and personal involvment in medical decisions are all still powerfully motivating forces in improving the health of people around the world. Simply recognizing the impact of maintaining a humorous perspective is an astonishingly powerful insight, let alone Cousin's numerous other contributions. His own recovery from a (thought to be) fatal illness, and his later recovery from a heart attack, add vitality to his thoughts on health. Cousins is a hell of a good writer. I guess he was a long-time editor of the Saturday Review. He engages you by taking complex medical issues and humanizing them. I think the autobiographical component is the best part of the book. It is amazing how sick he was and how completely he recovered. I also agree that the patient needs to be very involved in his/her healing, of course, much has changed in medicine since Anatomy was published. Perhaps this is a result of his writing,especially regarding Cousins is a hell of a good writer. I guess he was a long-time editor of the Saturday Review. He engages you by taking complex medical issues and humanizing them. I think the autobiographical component is the best part of the book. It is amazing how sick he was and how completely he recovered. I also agree that the patient needs to be very involved in his/her healing, of course, much has changed in medicine since Anatomy was published. Perhaps this is a result of his writing,especially regarding the patient-doctor relationship. One thing that needs to be noted is that Cousins has the advantage of wealth and has access to the finest doctors in the U.S. and the world. He doesn't really acknowledge this. Nor does he consider how his education factored into his approach to healing. Yes, patients can get access to information, but would your average patient be able to interpret the information as well as Cousins does? A special hardcover gift edition of the New York Times bestseller: Norman Cousins's phenomenal bestseller on illness overcome and the triumph of the human spirit. The premise of Norman Cousins's enormously influential work is that the human mind is capable of promoting the body's capacity for combating illness and healing itself even when faced with a seemingly hopeless medical predicament. The author recounts his personal experiences while working in close collaboration with his doctor to overco A special hardcover gift edition of the New York Times bestseller: Norman Cousins's phenomenal bestseller on illness overcome and the triumph of the human spirit. The premise of Norman Cousins's enormously influential work is that the human mind is capable of promoting the body's capacity for combating illness and healing itself even when faced with a seemingly hopeless medical predicament. The author recounts his personal experiences while working in close collaboration with his doctor to overcome a crippling and supposedly irreversible disease, and illustrates the life-saving and ultimately life-prolonging benefits to be gained by taking responsibility for one's own well-being. Cousins's story is inspirational reading for anyone contending with a serious illness. To me, it felt very scattered the way Cousins presented the information. He bounced around from one topic to another so fast, I got whip lash. I also felt that half of what he was discussing didn't pertain to the overall concept of the book. This is the first book in a long time that I've not been able to finish. I stopped reading just 10 pages shy of the end. It got to a point where I would read a full page and not even remember 2 seconds later what it had been about. I was done at that point. Si To me, it felt very scattered the way Cousins presented the information. He bounced around from one topic to another so fast, I got whip lash. I also felt that half of what he was discussing didn't pertain to the overall concept of the book. I really enjoyed this book. I know some of the reviews have mentioned that the information in this book is outdated. I have not done a lot of reading regarding health, nutrition, and serious illness, and this was a great introduction into these areas and how they are interconnected. It was a pretty easy read, as Mr. Cousins spoke mainly in laymans terms and used lots of personal anecdotes. I found that I shared a similar belief system as the author, even if I had not fleshed out the thoughts to I really enjoyed this book. I know some of the reviews have mentioned that the information in this book is outdated. I have not done a lot of reading regarding health, nutrition, and serious illness, and this was a great introduction into these areas and how they are interconnected. It was a pretty easy read, as Mr. Cousins spoke mainly in laymans terms and used lots of personal anecdotes. I found that I shared a similar belief system as the author, even if I had not fleshed out the thoughts to the extent he had. This book has encouraged me that I need to be more proactive about making sure my nutritional needs are being met, and I plan to start research into this area. 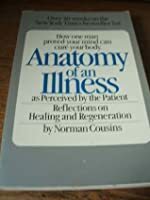 "Anatomy of an Illness as Perceived by the Patient" by Norman Cousins is a refreshing and powerful reminder of the power of the human mind and also of the capability of the human body to heal itself. "Attitude is everything" or "Perception is reality" sums up this book in three words. The power we have over our own bodies and minds (thoughts) is one of the things that differentiates us from lower species, and unfortunately, is something we are all too likely to forget, especially during times of "Anatomy of an Illness as Perceived by the Patient" by Norman Cousins is a refreshing and powerful reminder of the power of the human mind and also of the capability of the human body to heal itself. "Attitude is everything" or "Perception is reality" sums up this book in three words. The power we have over our own bodies and minds (thoughts) is one of the things that differentiates us from lower species, and unfortunately, is something we are all too likely to forget, especially during times of illness. Remaining positive in all situations, and taking responsibility for our own care are lessons that cannot be repeated often enough for optimizations of our lives in all situations. A quick, yet vital read! Short but sweet little book (you can read it in a day, no problem) that emphasizes the healing power of nature, or as Hippocrates called it, the vis medicatrix naturae. The idea that our bodies, if given the right environment, nutrients, and supports, can heal ourselves. The author, Norman Cousins, tells the tale of his of his own recovery from a debilitating illness through high dose vitamins and laughter. I love the emphasis on good attitude and how crucial it can be for healing. My favorite p Short but sweet little book (you can read it in a day, no problem) that emphasizes the healing power of nature, or as Hippocrates called it, the vis medicatrix naturae. The idea that our bodies, if given the right environment, nutrients, and supports, can heal ourselves. The author, Norman Cousins, tells the tale of his of his own recovery from a debilitating illness through high dose vitamins and laughter. I love the emphasis on good attitude and how crucial it can be for healing. My favorite part was the story of the witch doctor and allopathic doctor and how they share patients. If only more relationships like this existed in the health and wellness field. I had to read this book during my training (and loved it then) and I'm glad a decided to re-read lately. Its message, though simple, is a powerful one; one I try to convey to my patients on a daily basis. Stories of self-healing are always encouraging to me. This is one of the "classics" in the field of mind-body medicine. Even more interesting is the author's reflections on the US medical system and what has become standard diagnostic and treatment protocol. He proposes a more collaborative doctor-patient partnership and an open mind regarding potential therapies. He includes patients, medical professionals, and 3rd party payers in this paradigm. It was interesting to me that while there have bee Stories of self-healing are always encouraging to me. This is one of the "classics" in the field of mind-body medicine.